Complete working set of plans which includes: cover sheet, floor plans, electrical plans, elevations, cabinet elevations, roofing plan, and details as deemed necessary. Each additional set is $35. A digitally delivered printable file for the construction of a single residence. Requires a signed license agreement and site information. 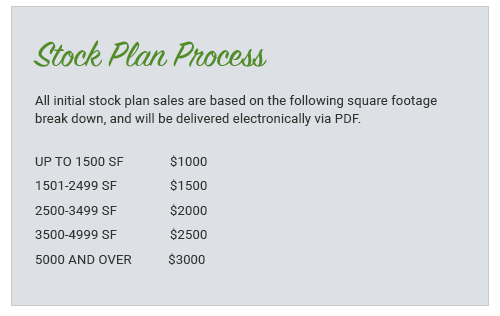 Stock Plan with changes are based on the PDF charge plus hourly charge of $125. Call for details and further questions. Mirror reversed plans cost a one-time fee of $250. Infinity Design, Inc. will gladly custom design your home. Call for rates. All prices, plans, square footage and building materials are subject to change without notice. All monies collected are non-refundable. Infinity Design, Inc. provides each customer with one set of ¼” scale (usually 36″ x 24″) plans, which includes cover sheet, floorplan(s), electrical plans, elevations, roof plan and cross section and details as needed. Detail Floor Plans – Drawn to 1/4″ scale. These plans show the layout of each floor of the house. Rooms and interior spaces are carefully dimensioned. Electrical Plans – Drawn to 1/4″ or 1/8″ scale. These plans show the electrical layout commonly used. Elevations – Drawn to 1/4″ or 1/8″ scale. These plans show the front, rear and sides of your house and give necessary notes on exterior materials and finishes. Roof Plan/Details – Drawn to 1/4″ or 1/8″ scale. These plans show the roof layout, cabinet elevations and any details and/or cross sections deemed necessary. Ceiling Joint/Roof Rafter Layouts - Not Provided. A certified professional engineer of record should design your ceiling joint and roof rafter layout in according to specific area and site needs. Infinity Design, Inc. home plans are protected under all Federal and International copyright laws. Reproduction of the plans, either in whole or part, including any for copying and/or preparation of derivative works thereof, for any reason without prior written permission, is strictly prohibited. The purchase of a plan license in no way transfers any copyright or other ownership interest in it to the buyer except as limited use of for the construction of one and only one dwelling unit. The purchase of additional sets of that home plan at a reduced price from the original set or as part of a multiple set package does not convey to the buyer a license to construct more than one dwelling. The purchase of an electronic plan license (PDF ) carries the same copyright restrictions as mentioned above. You are allowed to make up to a maximum of 15 copies for the construction of a single dwelling only. 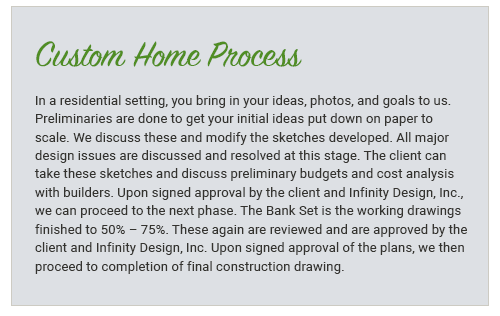 To use any plans to build more than one home and to avoid any copyright or license infringement, it is necessary to contact Infinity Design, Inc. to receive a release and license for any extended usage. Copyright licenses may not be transferred to any third party. ​All prices, plans, square footage and building materials are subject to change without notice. All monies collected are non-refundable.